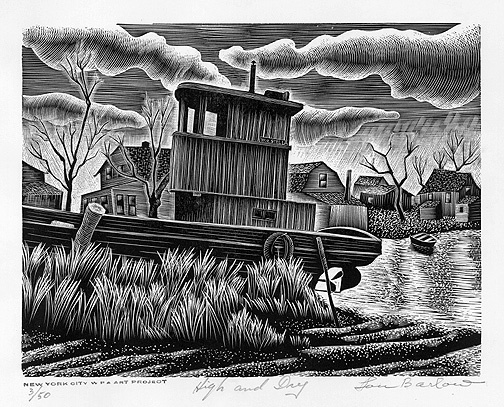 High and Dry --- 1939, Wood Engraving. Edition 50. Signed, titled and numbered 3/50 in pencil. Image size 6 1/8 x 8 inches (155 x 203 mm); sheet size 8 11/16 x 11 3/8 inches (220 x 289 mm). A fine, black impression, with full margins (1 1/8 to 1 3/4 inches), on cream wove paper, in excellent condition.Stamped NEW YORK CITY WPA ART PROJECT in lower left margin.